Get a great new chair for y our home or office. We are closing out several showroom samples. This is a great opportunity to get a great chair for a fraction of the cost. 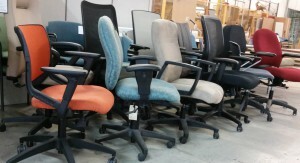 We have dozens of chairs including work chairs, big and tall and guest and reception chairs to choose from. All chairs are either $50 or $100 each. Stop into our Downers Grove showroom @ 2801 Centre Circle Drive, Downers Grove, IL 60515 while they last!